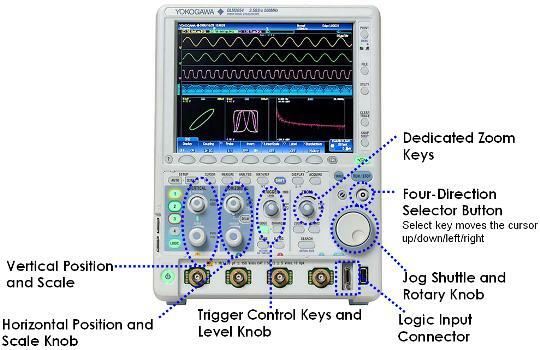 Yokogawa DLM2000 MSO Series 200MHz-500MHz Oscilloscopes | PSI Solutions, Inc.
Easy to use. Portrait body + large screen makes display easy to see. We elevated the large (8.4-inch) LCD screen up into the line of sight. Also, the portrait format saves space on the desk or test bench. 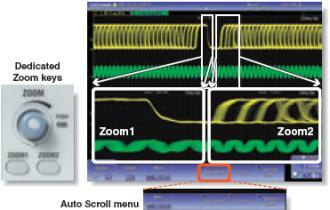 A compact "personal oscilloscope" designed for easy viewing and ease of use. 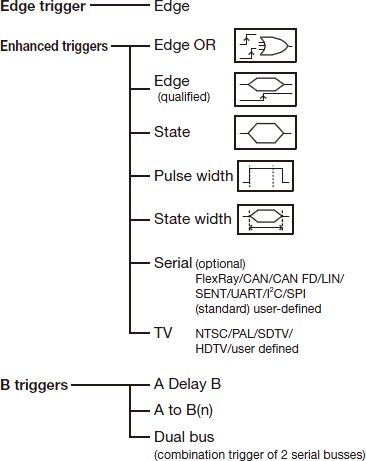 Four channels is not sufficient to view the functioning of digital control circuits. The DLM2000 series converts 4 ch of analog input to 8-bit logic, and functions as a 3 ch analog + 8-bit logic MSO (mixed signal oscilloscope). input analysis of I2C and SPI serial busses. With our proprietary ScopeCORE fast data processing IC, real time display is possible even signals of 11 inputs. Note: The /M1, /M2, /M3 memory expansion options are only available on 4ch models. The /M1S option is only available on 2ch models. Long memory is necessary to keep high speed sample rate in long term measurement. If 250 Mpoints (Memory expansion option /M3) is installed, Max. 0.2 sec waveform can be captured even at 1.25 GS/s sample rate when taking 2 ch measurements in Single mode. With the DLM2000 series, up to 50000 previously captured waveforms can be saved in the acquisition memory. With the History function, you can display just one or all of the previously captured waveforms (history waveforms) on screen. 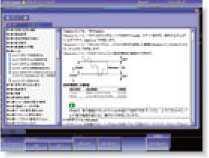 You can also perform cursor measurement, computation, and other operations on history waveforms. Using the History function, you can analyze rarely-occurring abnormal signals. The DLM2000 series comes with a variety of easy-to-configure triggers combining analog and logic inputs such as edge, enhanced, and B triggers. Trigger on the 7th edge of signal on B. This is effective for measurements with shifted timing, such as non-standard video signal vertical/horizontal periods or motor reference position pulses and drive pulses. Trigger on an arbitrarily set pattern of up to 128 bits. This is effective for detecting ID/Data and other portions of proprietary communication formats. Trigger on a combination of CAN and LIN bus triggers. I2C + SPI bus triggers, and other combinations are possible. Trigger when either LIN or CAN bus signal conditions become true. The DLM2000 series has two types of filters, one processed at the input circuit and one based on MATH functions. These filters are effective for rejecting unwanted signals, allowing observation of only the desired bandwidths. Each channel has 14 low pass filters available from 8 kHz to 200 MHz. Waveforms of limited bandwidths are stored in internal memory. The input waveform can be filtered using an IIR filter, which is a MATH function. Filtered waveforms can be displayed at the same time as the input waveform for comparison. You can select low pass or high pass filters. Because the DLM2000 series lets you set zoom factors independently, you can display two zoomed waveforms with different time axis scales at the same time. Also, using the Auto Scroll function, you can automatically scroll waveforms captured in long memory and change the zoomed location. With Auto Scroll you can choose forward, backward, fast-forward, scroll speed, and other control options. Normally, searching for data takes time and costs money, and long memory is useless without functions for extracting desired data from a large capacity memory. 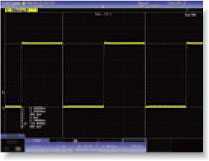 That's why the DLM2000 series does not simply offer long memory, it also provides powerful waveform search functions. ( shows the current location). 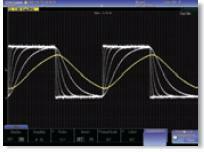 Criteria can be specified for extracting desired waveforms from up to 50,000 previously captured waveforms. 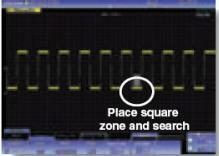 Searching for waveforms in zones created by moving measured waveforms up/down/left/right. 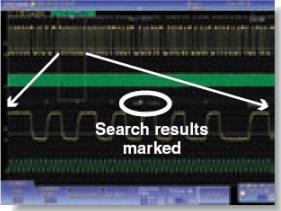 Search for waveforms that pass through/do not pass through a rectangular zone placed on screen. Twenty-eight waveform parameters are included such as: maximum, minimum, peak-to-peak, pulse width, period, frequency, rise/fall time, and duty ratio. 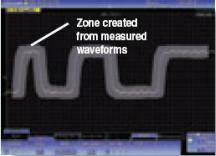 Automated measurement can be performed using up to 20 of these waveform parameters. Also, waveform parameters can be measured repeatedly, and the statistical values displayed (mean, maximum, minimum, standard deviation, etc.). Waveform parameters such as period, pulse width, and amplitude can be measured repeatedly and displayed in graphs. In a single screen you can observe period-by-period fluctuations, compute amplitudes every screen using multiple waveforms, and display amplitudes as trends. You can also display histograms referencing the voltage or time axis using values from repeated automated measurement of waveform parameters. Cursors can be placed on the displayed waveform from signal data, and various measurement values at the intersection of the cursor and waveform can be displayed. There are six types of cursor; ΔT, ΔV, ΔT& ΔV, Marker, Degree Cursor. Up to 2 FFT analyses can be performed simultaneously. 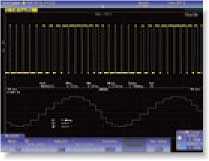 FFT can be performed on computed waveforms in addition to the actual waveforms on CH1 to CH4. 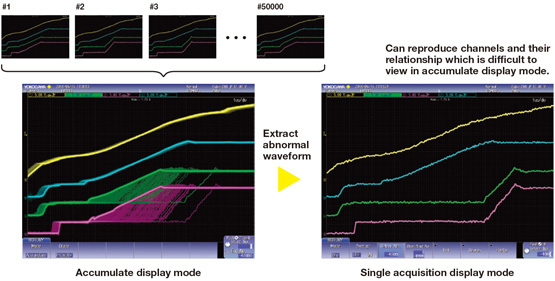 Analysis can be performed of the frequency components of waveforms filtered for limited bandwidth, of frequency for changes in period of rotary objects, and other phenomena. 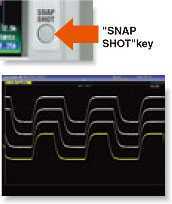 By pressing the SNAPSHOT key to the lower right of the screen, you can freeze a white trace of the currently displayed waveform on the screen. You can press the key repeatedly and conveniently leave traces for comparing multiple waveforms. Also, snapshot data recorded on screen can be saved or loaded as files, and can be recalled for use as reference waveforms when making comparisons. Thumbnails of waveform data, waveform image data, and Wave-Zone files can be displayed. The image and file names are shown so that you can view screen image contents while copying or deleting files. 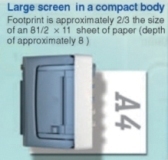 A file can be enlarged to confirm the data. GO/NO-GO can be determined using trigger conditions, zone waveforms, measurement parameters, and other criteria. 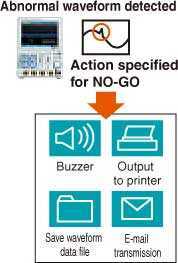 For NO-GO, actions can be carried out at the same time such as sounding a buzzer, saving the current waveform, or sending notification to a designated e-mail address. 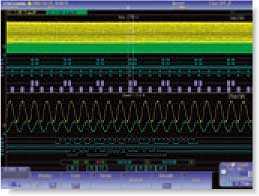 Waveforms in which an abnormality occurred can be saved for confirmation and analysis of the phenomena at a later time. You can view detailed graphical explanations of the oscilloscope's functions by pressing the "?" key in the lower left of the screen. This lets you get help on functions and operations on screen without having to consult the user's manual. This is a license product for adding applicable optional features on to DLM2000 series on your own. It is necessary to update main unit firmware in advance to V3.00 and above* in order to apply this license. This license is only valid for 4 ch models. * Firmware version 3.70 or higher is required to apply -F7, -F8, -F9, -X1 licenses. Triggers for embedded systems and in-vehicle bus signals are supported along with decode display analysis (serial bus analysis option only on 4 ch models). Logic input can also be used for serial buses (excluding FlexRay, CAN, CAN FD and LIN). Intelligent serial bus auto setup: Complicated trigger and decode settings such as bit rate and threshold level are automatically detected by DLM2000. Simultaneous analyses of four different busses: Up to four busses can be analyzed simultaneously. 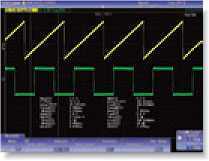 Waveforms and analysis results from busses with different speeds can be displayed using 2 Zoom windows. Dedicated power supply analysis options are available (4 ch models only) for switching loss, joule integral (i2t), SOA (safe operating area) analysis, harmonic analysis of power supply current based on EN61000-3-2, and other power parameter measurement such as active power, power factor etc. long cycles can be input for computation of switching loss (V(t) X i(t)). cycles of 50 Hz/60 Hz power line. can be statistically processed and caluculated. Using the GO/NO-GO function, you can output the result of the waveform judgement as a TTL level signal. You can output an image signal and check the waveform on an external monitor. Enables control from a PC. Supports USB storage, USB keyboards, USB printers. Power supply output terminal for current probes (701930 and 701931) and differential probes (701920, 701921, 701922, 700924, 700925, and 701926). Outputs a CMOS 3.3V level trigger signal. Lets you input a trigger signal separately from the input signal. Symbol Editor Create and Edit Physical Value Symbol Definition Files for the DL (M) Series. The DLM4000 is a unique to the industry eight-channel mixed-signal oscilloscope suitable to test and debugging applications in the embedded systems, power electronics, mechatronics, and automotive sectors. 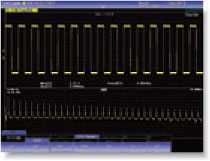 Available in both 350 MHz and 500 MHz models, the 2.5 GSa/sec DLM4000 features eight analog input channels. 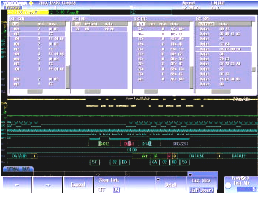 The eighth input channel features Flex MSO which converts to a 8-bit logic analyzer at the push of a button; add sixteen additional logic analyzer inputs as an option, for 24-bit logic analysis. Advanced measurement and analysis features such as power analysis and serial-bus analysis, digital filtering, user-defined math, and super-long record lengths (up to 250 Mega Points) make the DLM4000 a super powerful engineering tool. High-resolution 12.1-inch LCD display, compact landscape format, ergonomic and friendly user-interface make it easy to use. 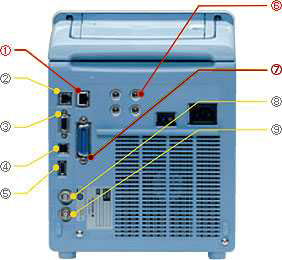 When the software program starts, the front panel image of the connected DL or WT (control panel) appears on the monitor of your PC. You can control the DL or WT from your PC with the mouse to simulate operations using the front panel keys of the instrument. 1Excluding DL9000 series and SB series. Please use Xwirepuller for these instruments. 2WT1600 does not support USB interface. The Model 2241-00 is a Precision Current Instrument Transformer for use with high accuracy Power Analyzers and Ammeters.